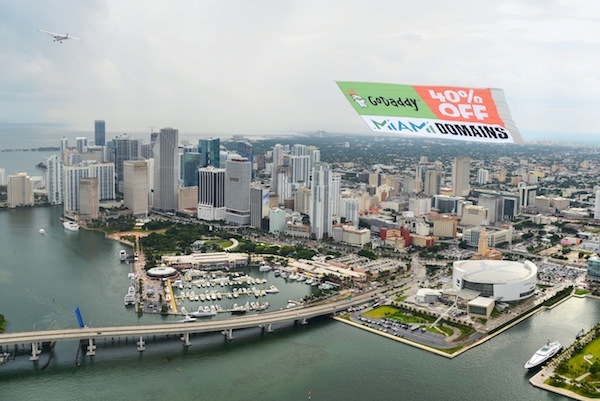 Since .Miami launched earlier in October, I understand that GoDaddy has been advertising via local radio commercials, search engine marketing, website placements, and social media marketing. The airplane banner will be seen at various Miami events, but this is the only Dolphins game for the banner. Obviously, it would not be feasible for the company to track the results from this banner and other general advertising like this. In less than a month since .Miami launched, just over 11,000 .Miami domain names have been registered. GoDaddy has just over 50% of the .Miami registrations, according to nTLDStats.com. .Miami domain names do not have nexus requirements, and they are available for sale to anyone. As you can see, they can be registered at GoDaddy and other domain name registrars. If you see any co-operative marketing efforts like this, please let me know. I think it’s neat to see and I’d be happy to share them. Thanks to Colin Campbell for sharing this on Twitter. You can barely see there is a dot before Miami so how can people 3,000 feet below see it. In marketing campaigns like this you don’t need to show discounts either especially when it takes up half the banner. Marketing Fail. Maybe they only care about branding “Miami Domains?” If someone looks that up in Google or GoDaddy for that matter, they will find .Miami. I was at the game and I saw it pretty clearly. Great idea, but that dot before MIAMI sort of got lost. Maybe next time.